It is 10 p.m. Rehearsal is over, the actors are gone. But work for Clint Bryson is just beginning. 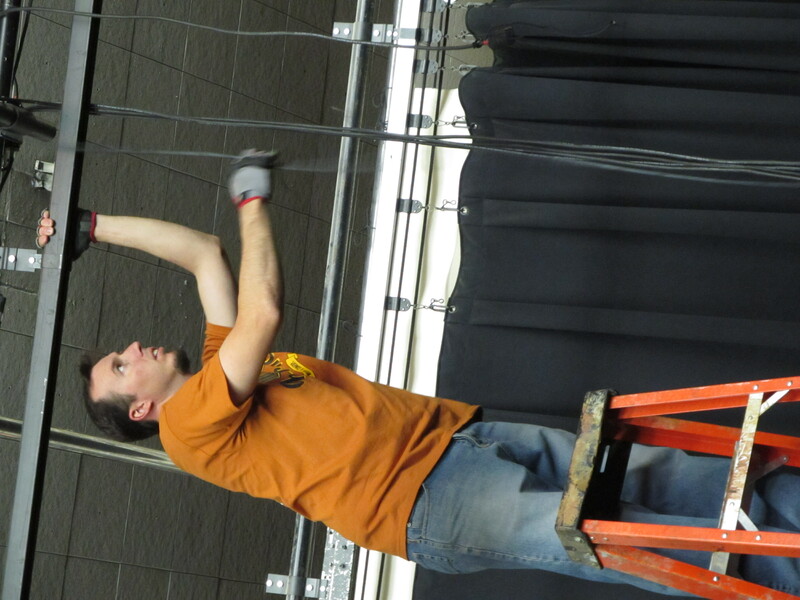 Though he designs and builds sets for the drama department at Catalina Foothills High School, Bryson is the lighting designer for The Winter’s Tale. 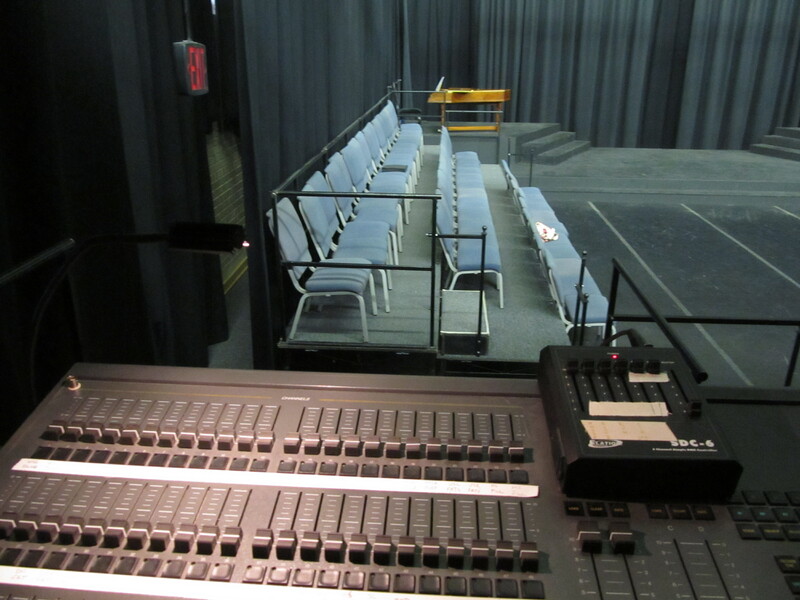 He began in theatre as an actor, but he discovered a passion for working backstage in college. This evening, Bryson is hooking up the lights. The process takes about 8 hours, spread over a couple of days. “One of the fun challenges here is that every show is a different configuration,” Bryson said, referring to the theatre’s changing setup. For Winter’s Tale, the stage is pushed back farther than normal, with two sections on either side for the musicians. There is a large section jutting out in the middle, the audience surrounding it on three sides. This means that Bryson must figure out how to treat all three sides equally. There’s an old adage in the theatre that the lights are something that shouldn’t be noticed. They serve to enhance and support the play, not be the focus. The lights are essential in driving the emotion and energy people experience. “It’s a lot of fun to have that kind of manipulation of an audience,” he said. He’s not the sole creative force behind the look of the lights. The process began with script consultation and style discussion with the director before he applied his knowledge. He typically watches one rehearsal near the end of the process to help make final lighting decisions. As an example, he explained how music influences his decisions. Like lighting, it helps set the emotion in a scene. Hearing the music can help pinpoint the specific emotion underlying the moment. 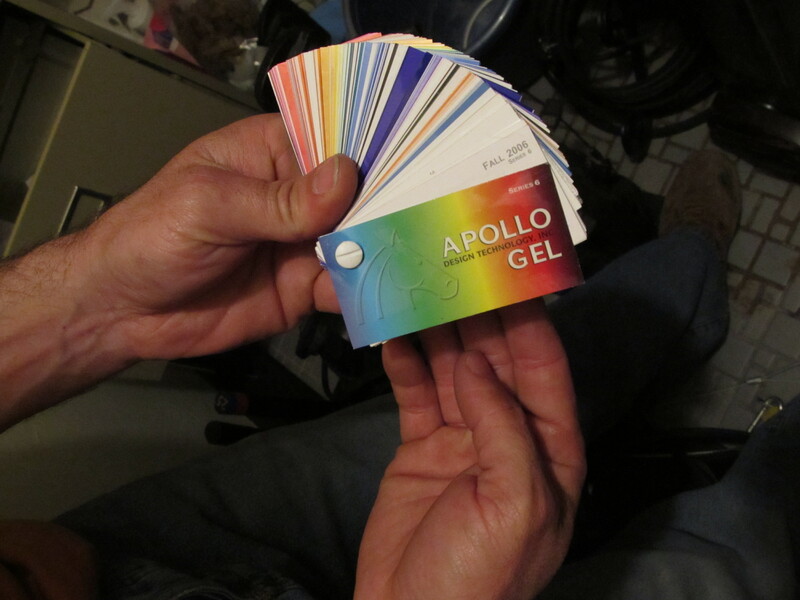 He then turns to the small swatch books full of colors, searches through the subtleties for just the perfect color. Though Bryson designed the lights, he won’t be running them for the show. 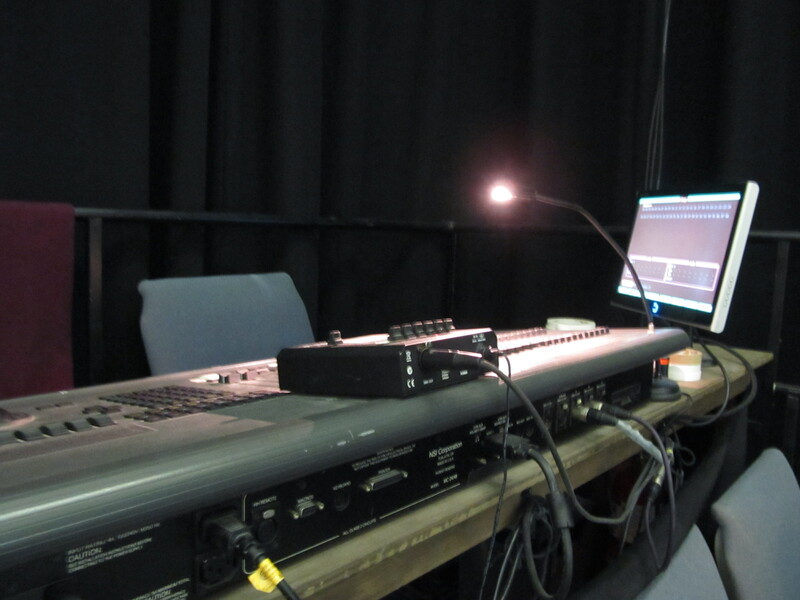 The stage manager, Leah Taylor, will ensure the cues run smoothly during the performance. TUCSON, Ariz – The long buffett table is loaded with Magpie’s pizza, salad and bottles of wine. A dessert table is covered with brownies, cookies and delicious cake pops. Chatter and laughter fill the house. It is the Rogue Theatre’s traditional meal before the first read of a new play, in this case, The Winter’s Tale, which will open April 27. According to the show’s director, Cynthia Meier, it was cast last May, but this is the first gathering of all the actors and crew. Veteran Rogue actors greet one another with enthusiastic hugs, and new cast members get introduced. “Time to eat! Time to eat!” Joe McGrath, the artistic director, announces but there is no mad rush for food. Conversations seem more engaging. Relationships between actors are key, according to Meier, since they help character relationships on stage. This meal is the start of turning a cast of actors and actresses into a family. 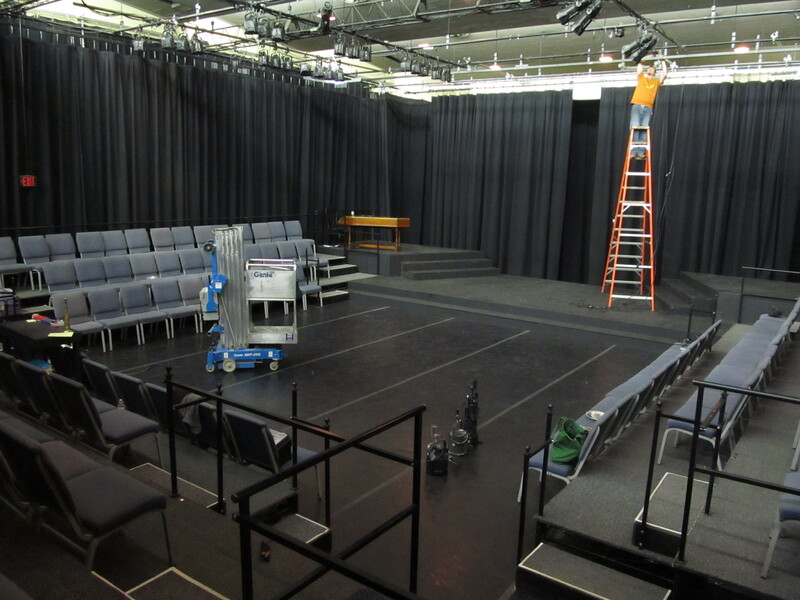 The practice began 3 years ago, after hearing of a similar even Chicago’s Lookingglass Theatre. At length, after everyone has eaten, Meier makes a toast. She said that though the play was written nearly 400 years ago, there is still something fresh and exciting about becoming one of the many artists to interpret the work. For casting, physical appearance wasn’t as important as an actor’s ability to convey an understanding of Shakespeare’s words. She said the company looked at how well an actor could make the poetry live. There is a flurry of activity as food is cleaned up and chairs are rearranged for the read through. The actors sit shoulder to shoulder, pressed tightly together on stage. The tables in front of them are covered with scripts, Shakespeare lexicon books, pens, pencils, highlighters and water bottles. McGrath urges the actors to not feel intimidated by the un-traditional circumstances of this first-read environment. Normally these rehearsals aren’t attended by outside supporters – in this case, members of the Rogue Theatre Company board. Meier takes her seat close to the stage. The lights dim. The stage manager, Leah Taylor, reads the stage directions. The play begins. The cast seems at ease. The synchronized turning of pages is sometimes interrupted by laughter. Some make small hand gestures and lean across the long table to direct their dialogue. Pieces of the characters’ personalities come through and the distinct Shakespearean cadance can be heard. Even in this early first read there is a sense of the differences between these two worlds. The events at the palace are serious while the scene with the shepard are light and amusing, elliciting laughs from everyone. Matt Cotten, a puppet designer who worked with the theatre in the past will design a giant puppet to be the bear. 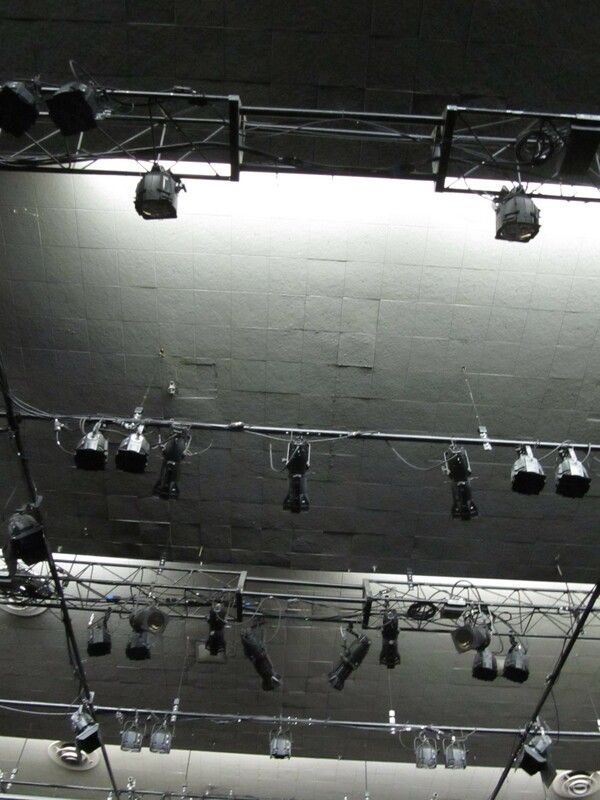 Backstage, some of Cotton’s previous work hang from the ceiling behind the large black stage curtains. Above Meier’s head, massive puppets loomed much larger and more threatening than one might expect. To gain a better understanding of the play, Meier spoke with Professor Fred Kiefer, a Shakespeare scholar at the University of Arizona. She read the text many times and even watched a few productions on video. However, one important idea is that this play is the ultimate wish fulfillment. At the end of the play, Leontes’ wife comes back to life. “All of us that have lost a loved one can understand yearning for resurrection.” Meier said. The Winter’s Tale isn’t a popular or widely performed Shakespeare play but there’s a richness to the text, a certain maturity that Shakespeare brings to one of his last plays that spurred The Rogue to choose this for production. They want to be thought provoking, to have material for discussion and the complexity of the plot and the interesting journey is one that invokes questions of who’s justified, who’s not, who’s the villain, who’s the hero. TUCSON, Ariz – Professor Fred Kiefer was out of breath when he reached his office on the fourth floor of the Modern Languages building. Arms laden with books he paused at his office door to unlock it, casting a glance over his shoulder. Kiefer is a professor of Shakespeare and Renaissance drama at the University of Arizona. Sitting in his office, framed by two desks covered in stacks of books and papers, Kiefer spoke about how he came to work with The Winter’s Tale director, Cynthia Meier. 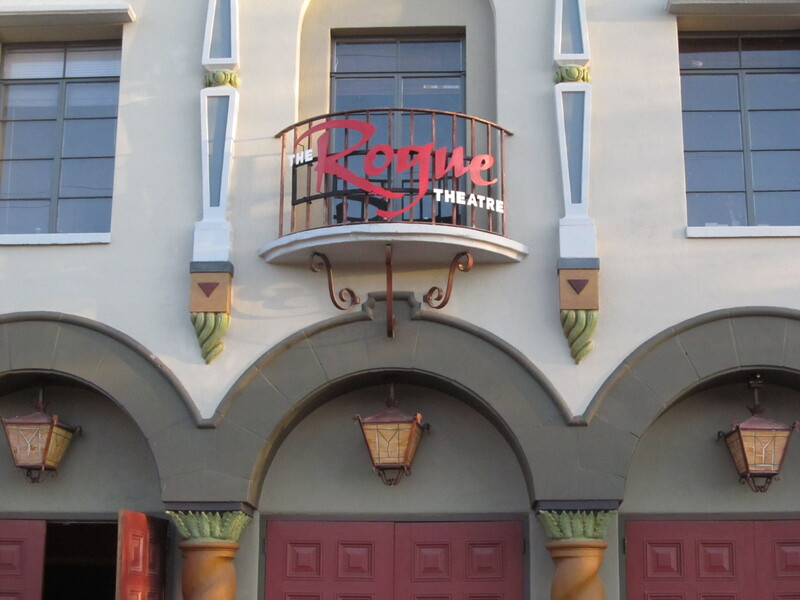 Patrick Baliani, a fellow professor at UA, has an ongoing relationship with The Rogue Theatre and suggested Meier speak with Kiefer about The Winter’s Tale. Kiefer said he emphasized one thing in particular when he spoke to Meier: the play has elements of a fairy tale. It’s not realistic yet it speaks profound truths through symbols, through the subconscious. Not one of his most famous plays, the piece has some interesting elements that set it apart from Shakespeare’s other works: the unusually long time span of 16 years, the two unique and contrasting locales, the shift from being a psychological drama in the first half to a comedy with a happy ending in the second half. Shakespeare plays tend to fall into obvious categories: history, comedy, tragedy. But the mix of dramatic elements within a comedic atmosphere makes it a difficult piece to classify. Though originally thought of as a comedy, recently scholars have regarded it more as a romance. This makes the play challenging, particularly for the audience. “It defies our expectations for realism.” He said. “The audience will have to adjust to that. Not much is known about Shakespeare’s private life at the time he wrote the play so we have few insights on the possible factors that influenced him. We do know that at the time he was beginning to plan for retirement, planning to leave the theatre world of London. According to Kiefer, it’s one of the last plays he wrote. Kiefer has seen his fair share of performances of The Winter’s Tale. One production in London took place in present day with electric guitars providing the music.